FastMed not only provides urgent care for most services (with the exception of the most critical injuries and traumas)—we also offer on-site digital X-rays and lab services for your convenience. Our qualified medical staff will properly assess your injury and provide immediate care. We can also refer you to the appropriate specialist, if needed. In addition, we work closely with your primary care provider (PCP), if you have one, to ensure that your ongoing medical needs are met. With your permission and under strict privacy rules, we can share your electronic medical records and digital X-rays with all appropriate providers. At FastMed, we know that accidents and injuries can occur at any time of day. That’s why we’re open extended hours 7 days a week, 365 days a year, holidays included. Let us provide fast diagnostic services for your illness, injury, or accident. We’ll give you the immediate care you need with no appointment necessary and without the additional expense of the typical hospital emergency room. X-rays are images that allow a medical practitioner to see what’s going on inside the body. Traditional X-ray images are created on photographic film, which is then developed to present a contrasted picture of a section of the body, such as the lung or foot, for example. X-ray usage allows a doctor or practitioner to determine the cause of a problem. In the case of digital X-rays or digital radiography, the images are captured on digital X-ray sensors rather than on photographic film. This saves us the time required for chemical processing of traditional X-rays. It also allows digital transfer and enhancement of the images to give us a more detailed and accurate view. Radiography is a quick, painless process that passes X-ray beams through the body to reveal images. The appearance of the images captured is based on the density of the materials the beams pass through. For example, bones that are dense by nature show up as white. The air in the lungs shows up much darker. Muscles and fat appear as shades of gray. FastMed utilizes expert radiologists trained to recognize the variations in images and any abnormalities they portray. The results are then used by your medical examiner to determine the best course of treatment. What types of X-rays are there? Aside from the specifications of digital and conventional X-rays, these images are often classified in other ways, such as dental X-rays for examining the teeth and oral cavity; bone or foot X-rays to look for breaks, fractures, or other abnormalities; and chest or lung X-rays to determine conditions such as pneumonia or tuberculosis. Mammograms, too, are a specialized version of X-rays that capture images of breast tissue. In most cases, however, digital and traditional X-rays are simply classified according to the area of the body they capture, such as an arm, hand, or foot X-ray. X-rays, particularly digital radiographs, provide a clear view of the denser material inside the body. For evaluation of less-dense areas such as joints, muscles, and tendons, an MRI may be required. Or, for more complicated trauma cases, a CT or CAT scan may be needed to clearly show details too difficult to see on an X-ray. Where to get an X-ray? 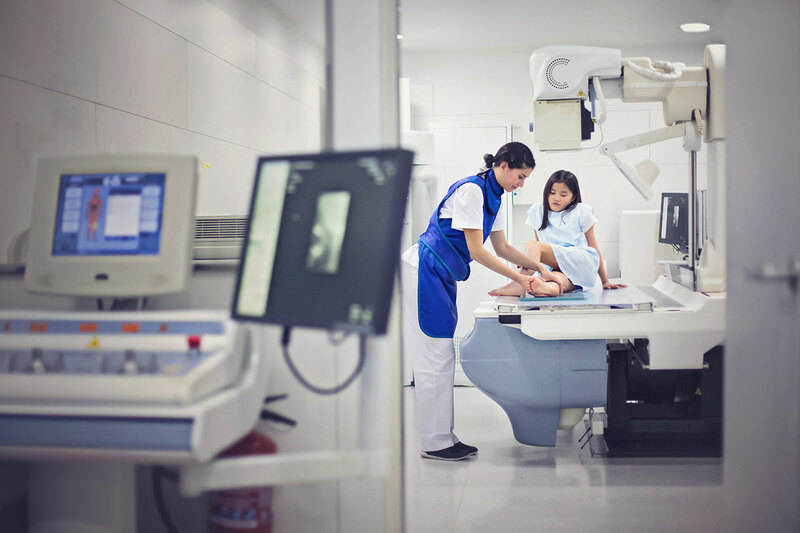 If you have an injury or illness that may require an X-ray, our medical staff can give you the care you need quickly, efficiently, and affordably. We’ll provide the evaluation, services, and any prescriptions you need to get you back to your everyday life in no time. We’re open extended hours 7 days a week for just these types of minor medical emergencies. No appointment is ever necessary. If preferred, you can check in online in advance for convenience.